When did you join roller derby? How did you hear about it? My first interaction with roller derby was in 2006. 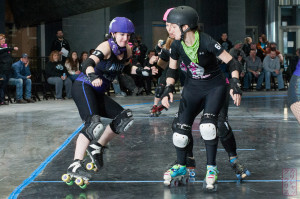 I had just moved to a town outside of Nashville, TN and was looking up things to do there, when I came across a Myspace page that announced the forming of the Nashville Roller Girls. I didn’t know anything about the sport at that point, but knew I wanted to be involved. I bought the cheapest pair of “derby skates” I could find and some X Games pads from Toys ‘R’ Us and started skating in an airport hangar on the Nashville Fairgrounds. Unfortunately between my empty pockets and awful work hours, after a few months it was apparent that it was not my time to derby. After I moved back home in Allegany, NY, I still had the derby itch and found that the Queen City Roller Girls existed. I immediately signed up for that year’s boot camp in 2008. On the last day when it was announced we could start coming to league practices, I realized that I would probably need to move to Buffalo instead of commuting 3 times a week. Somehow I found a job pretty quickly and made the move, but I had to bow out of derby for another year due to my work schedule. Finally, in 2009 I was able to plan my life around derby practices and have been skating with the QCRG ever since. 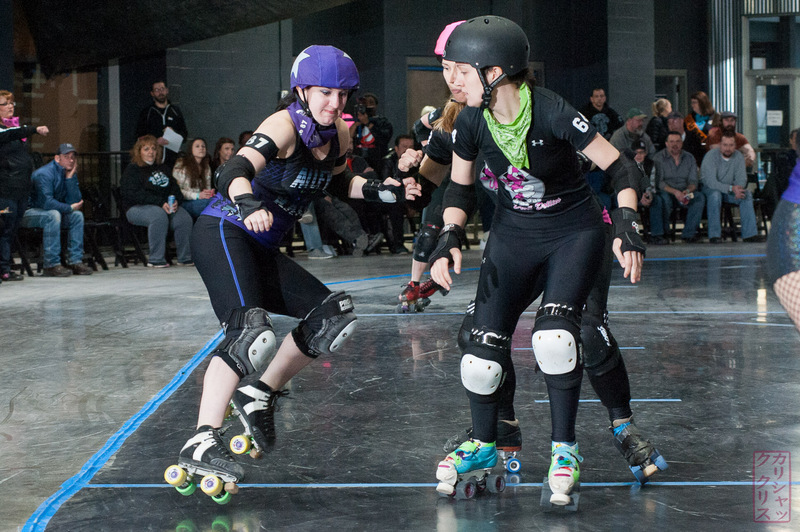 What is the meaning behind your derby name? How were you as a skater when you started? How have you improved in the years since? I wasn’t necessarily “good” when I started but I was determined and wanted this so bad so I would push myself every minute of every practice to be faster and better. I have definitely grown as a skater and strive to continue to improve. What do you do to train outside of derby? I tend to get my outside training through just having fun. I play in a street hockey league with a bunch of guys every weekend and like to do other things outside like skate, bike, run around the woods, etc. What skates and wheels do you have? I use the Antik MG2 skate boot because it felt so good when I tried one on. I love the support they give. For wheels I have used a combination of Heartless wheels. I love the size of them and that you can mix and match different hardnesses based on your needs. Do you believe derby has changed in the years that you’ve been skating? How? Many things have actually changed in the sport since I’ve played and will continue to do so I’m sure. The single whistle start and 30 second penalties are a few of the changes that have had a huge impact on the sport. I hate change at first, but after getting used to it you see that most of the changes really do make for a more exciting, faster paced game. What would you suggest to someone who is considering joining roller derby? Do it. Seriously. Don’t be afraid. Just jump in. Ask questions. Swing by your friendly neighborhood skate store, Turnaround Skates, and talk to the owner Ilana, and any skaters who happen to be in the store. You will leave there so pumped. Next Article Lake Effect Furies going to first WFTDA Division 1 Playoffs!